I've been struck by two contrary views on legal education recently. The first is by Matt Leichter on the inflexibility of the law degree. The second is an announcement by Michigan State University College of Law had received a $150,000 grant to support its new ReInvent Law Laboratory from the Kauffman Foundation. Leichter, as creator of The Law School Tuition Bubble, is as you would imagine more dystopian in his view of legal education. (I agree with much of what he says in Bubble.) The gist of his American Lawyer piece is that the versatility of the JD degree is a misnomer for law graduates not being able to find jobs. Because the ABA convinced states to accept its monopoly over accrediting law schools the purpose of law school was to train lawyers for law jobs. 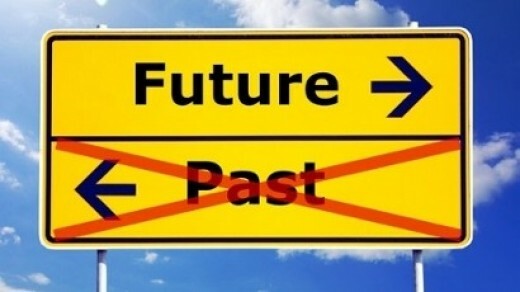 Moving into other careers, ancillary or otherwise, was accidental. It has been recognized from Max Weber onwards that law has been one of the most, if not the most, transferable and portable of educations and skills around. More so than engineering (but compare China) or administration (compare France). Political scientists have demonstrated the clear predominance of lawyers in legislatures at both state and federal levels. And 25 of the 43 presidents of the United States were lawyers. For Leichter the luxury of latitude is now too expensive and so law degrees must be of single purpose. I think he is doing law and himself an injustice. While legal education is in crisis, there are bright areas where teachers and scholars are trying to reinvent law and legal education in ways that don't detract from its purpose (read Karl Llewellyn on "law jobs"), but augment and expand its remit. ReInvent Law is one of these explorations. It takes the idea of collaboration seriously and that lawyers can learn from other disciplines and practice. ReInvent Law also wants to eradicate the essential conservatism of law by introducing ideas of entrepreneurialism. The founders, Renee Knake and Dan Katz, have of course spent time in the UK and are acquainted with the new entrepreneurialism of legal services here. The expansion of Alternative Business Structures and online provision of legal services, to mention two, inform their course on Entrepreneurial Lawyering. ReInvent Law is the indicator of the way things are going or ought to go in legal education, especially if it is to drag itself out of the morass it's in. It builds on the success of Miami's Law Without Walls and Temple's LawMeets. There are high barriers to overcome, the conservatism of law and lawyers, the move to interdisciplinarity, and the readiness of the market to accept these new ideas. In some ways programs like ReInvent Law are pushing at opening doors. We know that law firms aren't looking for just highly-trained technical lawyers: they want people who can think about business, clients as well as law. These programs drive to the core of this thinking. Neither LawMeets nor ReInvent Law would have received the grants they attracted if this weren't so. Yet they are still on the edge of law and we need to drag them to the centre. With the crisis in US legal education and the UK undergoing a fundamental review of its own legal education, you would think that most law teachers would be retrenching and keeping their heads low. Despite that a few ventures shine through the gloom and make what we do feel worthwhile. I'm involved with one, Law Without Walls, but here's another that has captured my imagination. difference, are the components teachable? LawMeets attempts to answer those questions so that future deal lawyers will have the skills to work in a changing and globalizing world. The idea takes elements of apprenticeship, moot court, and observation and blends them. It's web-based so that it is scalable and relatively inexpensive to operate. The sequence a student follows is watching a video with a hypothetical client which is followed by research on possible answers for the client. The student submits a performance to the the LawMeets platform (which is on video) and then students review other students' performances. Those that receive the top ratings are funneled to a panel of experts who review and rate the students. The experts leave both written feedback and video demonstrations of how they would do it. All students have access to the expert deliberations. And all the performances are saved in LawMeets portfolios. LawMeets has been successful. One measure is that it has managed to gain $500,000 of funding from the National Science Foundation. Others are that an increasing number of law schools are participating in its programs; more professors are piloting it; and a rising number of lawyers are eager to participate in LawMeets. 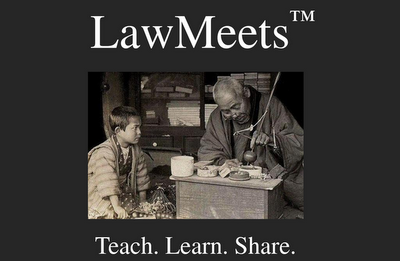 LawMeets is one of those simple ideas that makes one wonder why it hasn't been done before. Why did it take so long? 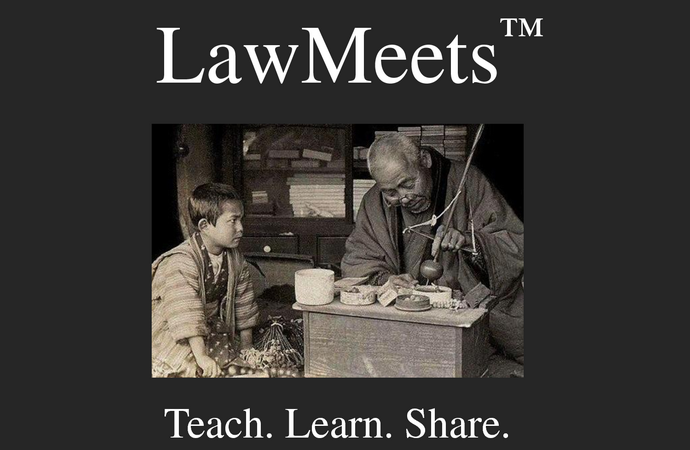 The structure and processes of LawMeets are easily transferable to other areas and fields and could potentially reach thousands. A recent article by Christopher Caldwell in the Financial Times predicts Ivory Towers will be Toppled by Online Tsunami. As professors at Stanford and MIT run massive online open courses for up to 200,000 students across the globe, we can see that the demand for education, and legal education, will alter. Will your student body be from your own country or will they be online from China and India? The recent LawTechCamp London 2012 demonstrated how different approaches to law were not only exciting and engaging, but more importantly actually demonstrated how they could open up areas of law and its analysis that we didn't before appreciate. Ideas such as LawMeets and LWOW show to us why we need to come up with new modes of education. We know that in five to ten years we won't know what knowledge we need. That's a frightening thought. But rather than being scared off by it, we should challenge it and get creative as LawMeets and LWOW are doing. In the wake of the Legal Aid, Sentencing and Punishment of Offenders Act 2012 (LASPO), comes a fly-on-the-wall documentary about a legal aid law firm in the north of England, Tuckers Solicitors. Chameleon Television spent a year filming the law firm--its internal meetings, discussions between lawyers and clients, and reflections by lawyers and clients on the outcomes of their cases. I came away from this programme both mildly hopeful but also full of despair. The prevailing feeling is of the utter hopelessness of the clients who return time and time again. Whether it's a 63 year old drug dealer or a 29 year old gay man fighting with his 19 year old lover, they continue to repeat their behaviour. 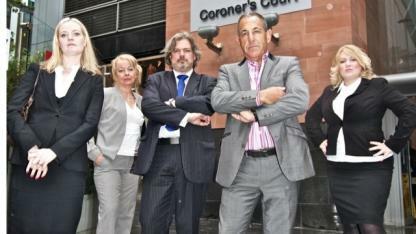 The firm is funded almost entirely by legal aid, which the government is trying to curtail. Tuckers receives about £10 million in legal aid fees. Most of our legal aid goes on criminal cases with very little on civil. In one remarkable scene the marketing person calls a meeting of the lawyers and paralegals and starts by telling them, "No one's being laid off. You're not here for a bollocking. We need more clients...we need more shoplifters!" Tuckers represents that eternal tension for students of the profession: access to justice and profit making. Indeed the lead lawyer (in the shiny suit above) says, "We're a business. We have to make a profit." Tuckers is the antithesis of the big City law firm except for one thing. Both have clients who are sophisticated repeat players. The problem is that Tuckers' clients aren't very intelligent hence their recidivism. There are other causes, I'm sure, but the amount of damage that seemed to result from drink and drugs was huge. Take the client who was caught on CCTV wondering into a jeweller's during the summer's riots. He was out of his mind on booze. It's doubtful he could have stolen anything even if he wanted to. An ex-soldier now homeless, he was the only client who understood to arrive at court wearing a suit and tie. The 29 year old (above), Tim, who came across as affable and genial, if slightly thick, apparently turned into a wild man when on the booze. At one point Tim has been arrested for drunkenly fighting with his boyfriend (again), and this time he's found in possession of a stolen bus pass and has also kicked in the window of a restaurant. He's admitted half of this to the police and his lawyer coaches him how to say "No comment" to questions. It is pathetic as he parrots her. When Tim eventually comes out of jail, having exhausted his get out of jail cards, we see him meeting his boyfriend and we know they are about to go off and get pissed and that Tim will be one of Tuckers' mainstays. Then there are the clients who end up fighting with their lawyers. These are the ones who believe in the "justice" of the system and that "truth" will come out. The results show them how misguided their beliefs are. It's painful. I suppose, thank god, there are firms like Tuckers because I'm not sure who would represent these clients. Although they committed criminal acts, most weren't criminals in that sense of full mens rea. They were unfortunates, depressed, schizophrenic, homeless, on benefits, constantly in battle with the state and its bureaucracy. Somehow the criminal system is the last part of the state apparatus that should be dealing with them. It can't, it's incapable, underfunded and powerless. The criminal justice system is expensive and inefficient, or rather it doesn't work. (Look at the Director of Public Prosecutions' machinations over the Paul Chambers Twitter joke trial and appeal for a different yet telling example.) Tuckers' clients need some way of realizing their human potential through work, education, and feeling valued. But they are presented as the lumpen proletariat, completely unsalvageable wrecks of society. I don't know what the answer is but I know we haven't got it right yet.